Holmarc's MM214VM is a affordable measuring microscope in MM214V Series are well suited for wide range of applications from shop-floor inspection, measurement of tools and machined parts to precise measurement of test tools in a measuring room. It is designed as a monocular optical system with an angular measurement dial, suited for measuring angles. Angle measurement is performed easily by turning the angle scale disc to align the cross-hair reticle with the workpiece image. It can also be used to check the shape of screws and gears by attaching an optional reticle. Designed for those who prefer to measure with their own eye, the monocular eyepiece tube model is available. The C-Mount Video Head model provides easy video monitoring. Bottom, Angled and co-axial illumination are provided in TM215V Series. A high bright Green LED is employed as the co-axial light source. Illumination intensity can be adjusted for most convenient and suitable illumination. Excellent for precise measurements of angles, lengths, diameters, and any distances on the specimen. X,Y & Z stages available with linear scales and DRO unit. Ideal for measurements of hardness test indentations. Suitable for thread inspection and verification of tool angles. 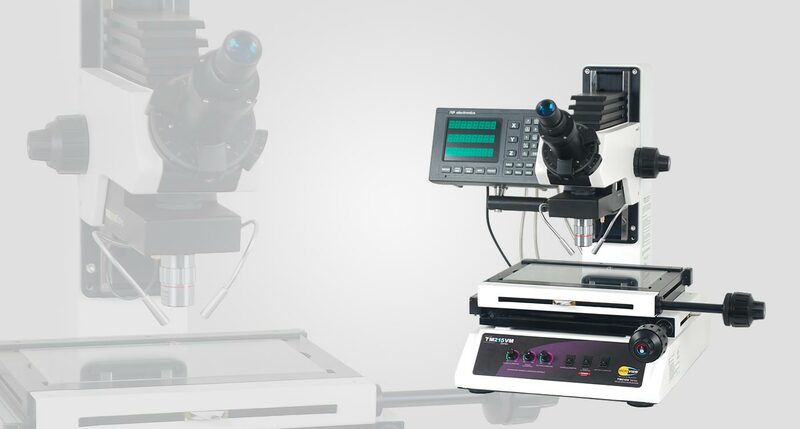 The eye piece of this microscope is fitted with cross wire and measuring scale. The cross wire acts as a reference point for taking fine measurements. The XY stage used is of measurement grade fitted with precision micrometers of 1micron resolution. The micrometers can be either conventional engraved type or with digital display depending on the application. As the cross wire is fitted to only one eyepiece, these microscopes are monocular generally. Measurements are taken by movement of the stage. The crosswire is aligned with the first reference line or a point on the specimen or test object. Then the stage is moved watching the image to the second point on the object. Actual measurements are provided by micrometer reading. The depth can also be measured precisely using the micrometer on Z stage on which the optics head is fixed. By lowering or raising optics head, a point can be made in to focus or out of focus. By bringing the two points at different depths into focus one by one by moving the Z- micrometer, the depth can be obtained from the micrometer readings. Digital readout for XY stages are also available. The quick-release system is enabled on all long XY measuring stage, which is especially useful in longstroke measurements. Large-size grip knobs are provided on both sides of the column for focusing using the fine / coarse movement.